MicroLaser Facial is MBLA’s Signature Treatment for treating unwanted pigmentation while addressing anti-aging issues. Dr. Small combined state-of-the-art 1064nm laser protocols with prescription-grade Esthetician treatments to effectively stimulate collagen remodeling at the cellular level while addressing a multitude of concerns for your skin texture and tone. MicroLaser Facial gives you real results whether your concern is Melasma, overactive sebaceous glands, large pores, rough texture or simply to keep fine lines and wrinkles at bay or to maintain a clear and smooth complexion. This treatment is highly individualized based on your skin needs. A complimentary consultation with Dr. Small can be arranged to formulate your specific treatment plan. How long do the treatments take? Does it hurt? This treatment combination takes about 1 ½ hours, with minimal to no discomfort. Does the 1064nm Q-switched laser also remove hair? As an added bonus, 1064nm Q-switched laser treatments can also permanently reduce those difficult to remove fine dark hairs on the face or other areas. Click to enlargeThe results from MicroLaser Facial are cumulative and we typically recommend a series of six treatments at monthly intervals to maximize benefits. Combining laser treatments with medical skin care will penetrate deeper into the skin and optimize results. Each treatment plan is specially customized for each individual to address specific concerns. 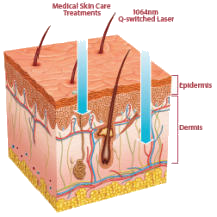 The figure to the left shows the different levels of penetration for laser and skin care treatments.